Robbinsville NC Mountain View Home with Stream on 5 Acres for Sale. Graham County NC Realtor. Graham County NC Realtor. Mountain and lake view homes, cabins near Lake Santeetlah and Fontana for sale. Western North Carolina Mountain homes for sale. 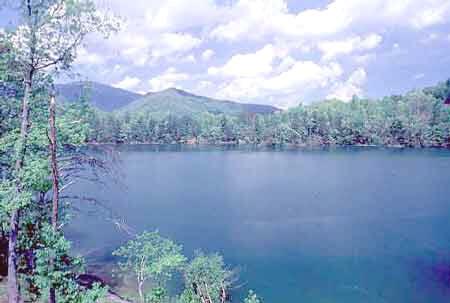 Lakefront log homes, cabins, waterfront homes, lake front homes, lakeside house, river homes, gated community golf course development homes in the North Carolina Smoky Mountains. Robbinsville, Graham County log homes, creek front houses, trout stream cabins, weekend getaway vacation homes in the NC Smoky, Smokey, Smokies Mountains. 474 - Getaway Cabin on 5 +/- Acres with Stream - Rustic 3BR/2BA home located on 5 +/- acres w/noisy stream through property. Spacious LR with FP, open DR/Kit. Large den w/ built in bookshelf on lower level. Master BR has sitting room w/ walkout porch. Additional room for office. Lots of decking, walkout patio, storage building, concrete pad for garage, & shed. Gentle sloping yard w/plenty of space for garden & nice mountain views only $170,000.